In an era of standards and norms where assessment tends to minimize or dismiss individual differences and results in punitive outcomes or no action at all, Assessment of Young Children provides teachers with an approach to assessment that is in the best interest of both children and their families. 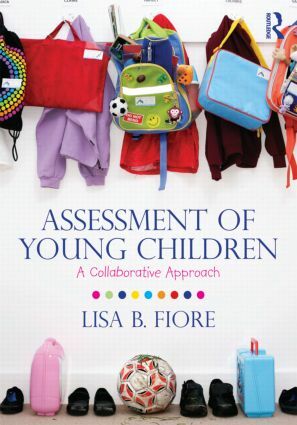 Author Lisa B. Fiore explores a variety of ways to study and assess young children in their natural environments, while stressing the importance of bringing children and families into the process. This lively text helps the reader learn how to cultivate developmentally appropriate practice, create appropriate expectations, examine children’s work, interact in groups, and improve their teacher behavior. Accounts of real experiences from children, families, teachers, and administrators provide on-the-ground models of assessment stategies and demonstrate how children are affected. Assessment of Young Children explores both standardized and authentic assessment, work sampling systems, and observation skills. Readers will walk away with strategies for communicating information about children and portfolio assessment, and how the use of formal and informal methods of observation, documentation, and assessment are connected to teacher and student inquiry. Assessment of Young Children encourages an assessment strategy where the child remains the focus and explores how collaboration with children, families, and colleagues creates an image—not a diagnosis—of the child that is empowering rather than constraining. Case Study examples that anchor the concepts presented in the chapters and engage readers more deeply in the content.